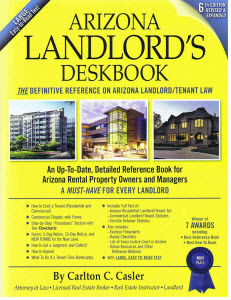 Arizona Landlord Tenant Blog: What is the difference between a lease/purchase and a lease/option? I have a lease with option to purchase with people for 6 years. They are always behind a month or more. My lease with option purchase has a 7 day default. Can i take them to eviction court or do i have to forclose? Response by Carlton C. Casler: Assuming you have a "true" lease with an option to purchase, rather than a lease/purchase, then you may evict the tenants for non-payment of rent. Start with the 5-Day Notice to Pay or Quit, then file the Special Detainer Complaint with the appropriate justice court. Check to see if your option agreement has a "cross default" provision; if not, make sure that it does next time.